This very relevant documentary poignantly portrayed by director Matthew Heineman is something to behold. 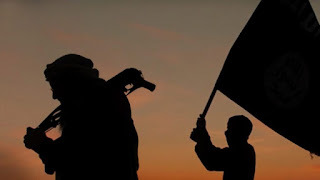 It centers around the city of Raqqa, Syria where several young activists risk their lives for freedom to document the systematic takeover of their home by ISIS. After dealing with Bashar al-Assad as running Syria ISIS began to grow and siege towns with extreme violence, to opposed them is to die. When even the Arabic news sources were not even reporting the out right atrocities happening in their city they took it upon themselves to record what was happening. With just their cell phones they got evidence of public lynchings, destruction, and torture of the people of Raqqa. They began to post it on social media to get the attention of the world to their plight under the name "Raqqa is Being Silently Slaughtered". Their page began to build in size as they would report not only in Arabic but English as well so that someone, anyone would see them and do something to help their home. Matthew Heineman gets personal access to the lives of RBSS, showing the mental anguish and emotional pain of living underground and on the run from a totalitarian regime under the guise of the Islam state. Not only losing friends but family by being targets of ISIS is depicted on the screen in gruesome detail. A eye opening film for anyone that doesn't understand or know what is happening in Syria right now. Finding out how far the reach of ISIS is a shocking fact for these men and their families even to this day. Unintentionally becoming international journalist while living in exile from their homeland, with connections still in Syria they continue their work. Watching them is heart breaking thankfully at times they can smile, but mostly they are just trying to drive off the urge to have a mental breakdown everyday. This documentary was tastefully done even though it is explicit and raw so I know that many people will not want to see this, but I want you to fight that urge. I understand that you don't expose yourself to this kind of extreme violence, but you have to understand that this is everyday life for them. This is something that I'll tell everyone to go see it's extremely necessary at this time. With everything that is going on in the world to see the world through their eyes is definitely, most definitely worth the ticket.